In an absolute blinder of a game at Denver Harlequins home grounds, Cook Park, the hosts and visiting Boulder exchanged 8 leads and experienced an interval of knotted scores before a grounding at the death was cause for one side’s joy, whilst t’other was left to gnash their collective teeth in profound chagrin. Warming at the noon kickoff with a starting whistle by referee Brighton Khumalo and more reactive than proactive play early until a Harlequins flyer found space along touch and closed in the corner for a handful and it was 5-nil for the homeside in the eighth minute of action. Boulder gained the upper hand with a try and its conversion by former East High and CU Buff standout standoff, Sean Kilfoyle, and now Boulder’s lead at 7-5 after 15 ticks. Harlequins looked formidable with ball-in-hand banging short progressions from the breakdown. Jester joy and a new leader in the 24th minute with a try converted to goal and 12-7 the significant figures just then. With time dwindling in the first forty, a nifty, shifty movement by Kilfoyle and a lengthy fling on to the outside support saw a traveler’s dot made seven by the Boulder #10, and the numbers at Khumalo’s midpoint blast, 14-12, and lads for instruction and hydration now. Boulder seeing success with the field spread by the long distributions of their talented pivot to his outside back-three-backs, while homeboys looking sharp as they employed near-channel smashes from the loose and misdirectionaries [sic] in the centers. A converted try by the Harlequins opening the second stanza regaining them the lead at 19-14 in the 44th minute, but Boulder drew level two minutes on with a try and 19-for everyone at ‘46. Harlequins went ahead with a sticksplitter in the 53rd minute, 22-19, but relinquished that advantage quick as you’d like after a converted score by the guests and it was 26-22 at minute number 55. Homeside banged one over after snagging lineout ball in the Boulder business district and mauling into goal for the dropdown fiver: 27-26 nearing the hour mark. Boulder back on top as a swift and cutting counter by the Boulder fullback setup their fifth touch down of the day: 31-27 to the travelers at ‘64. Now the sides settled into slugfest it, and Harlequins suffering the consequences of woeful penalties-called; Boulder looking to sew up the road win with a final score. But it was Denver Harlequins who claimed lineout ball seven meters from goal and mauled virtually untouched to goal for the victory dot and its conversion and 34-31 the final at Khumalo’s final tweet. 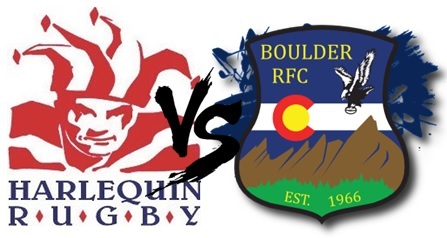 Boulder’s next action will be another preparatory fixture v Denver Highlanders, while Harlequins host Colorado Springs on that day.